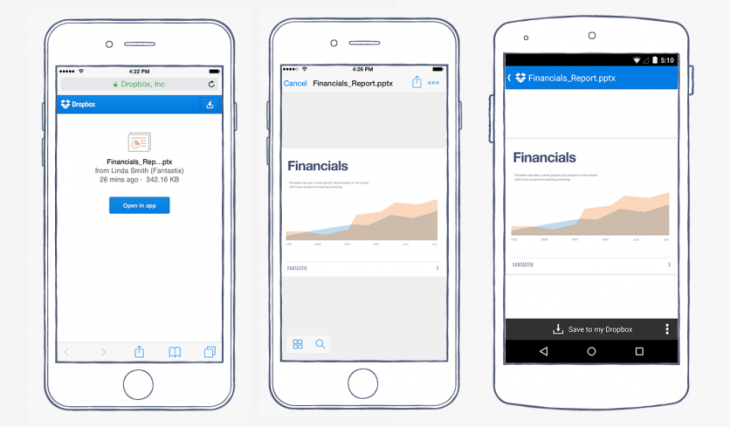 Dropbox is getting a little more useful for mobile users. As of today, you can open shared links directly in the mobile Android and iOS apps. Now, when you open shared link on your phone or tablet, you’ll open the file or folder right on your Dropbox app, allowing you to preview documents and photos quickly or easily save to your Dropbox account. Previously, you would have to open your mobile browser before you could access the file. If the document is already linked with your account, the URL will simply take you directly to the Dropbox app, where you can edit or open it. If it’s compatible with an Office Mobile app, you can open it in the respective program instead. The update is rolling out to all iOS and Android users over the next few days.